The company that tried to operate the Mir space station commercially announced plans Tuesday to launch its own private space station. MirCorp officials said Tuesday that the company had signed an agreement with the Russian space agency Rosaviakosmos and Russian aerospace company RSC Energia to develop, launch, and operate "Mini Station 1", an orbiting facility capable of supporting a wide range of commercial activities. The station, scheduled for launch in 2004, will be able to host three people for up to 20 days at a time. The station will be serviced by both unmanned Progress spacecraft and manned Soyuz spacecraft, the latter flying to the new station on the same taxi flights currently scheduled to the International Space Station. "MirCorp's Mini Station 1 agreement creates the first commercial space infrastructure, offering multiple flight opportunities under our control to a destination that will be fully supported by the private sector," Jeffrey Manber, MirCorp president, said in a statement. "It is not enough to talk about sending people to space: you need an assured means of transport, and you need a destination where the commercial customer is the first priority, not a secondary concern. MirCorp will have all of this, in very accommodating environment." Few specific details about Mini Station 1 were released, and MirCorp officials did not respond to a request for additional information about the station and the company's plans for it. MirCorp did say that a "detailed definition" of the station would be completed in October. Some additional details about Mini Station 1 could be gleaned from other sources. Illustrations published on MirCorp's web site show that the station appears to be a modified Soyuz spacecraft, superficially similar to Gamma, a Soviet-era gamma-ray observatory also based on Soyuz hardware. A node on one end of the spacecraft has at least two docking ports to accommodate Progress and Soyuz spacecraft. 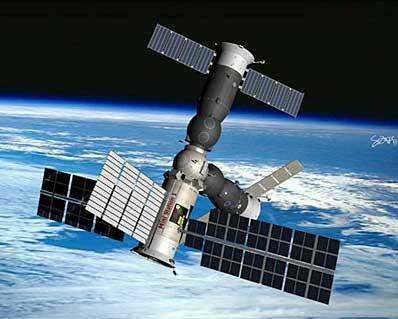 The station will also likely fly in an orbit similar to ISS. MirCorp said that crews visiting Mini Station 1 would combine their flights with regularly scheduled taxi missions to swap out the Soyuz spacecraft docked to ISS as the station's lifeboat. After completing its mission at Mini Station 1, the Soyuz and its crew would travel to ISS, returning to Earth shortly thereafter in the older Soyuz. Such a mission profile would only be feasible if the new station is in the same or nearly the same orbital plane as ISS and neither very far ahead nor behind it. MirCorp officials did not reveal the price of Mini Station 1 in its announcement, but other published reports estimated the cost at $100 million. This would make it similar in cost to Enterprise, a commercial ISS module that Energia is developing in a joint venture with American aerospace firm SPACEHAB. Tuesday's announcement of the station project is the latest twist in the short history of MirCorp, a company headquartered in Amsterdam and majority-owned by Energia. The company first entered the spotlight in February 2000 when the company announced that it would lease the Russian space station Mir and put the aging facility to commercial use. MirCorp did help fund the launch of one crew to Mir, cosmonauts Sergei Zalyotin and Alexander Kalery, who stayed on the station between early April and mid June of 2000. Shortly after the crew returned to Earth MirCorp announced plans to send California millionaire Dennis Tito to the station as the first commercial space tourist. MirCorp's fortunes took a downturn in October of last year, however, when the Russian government decided to deorbit the station rather than continue leasing it to the company. Efforts to reverse this decision failed, and Mir was brought down over the south Pacific in March of this year. Tito later flew in space as a passenger on a Soyuz taxi flight to the International Space Station in April. MirCorp arranged some commercial items that were flown to the station on that flight, including Radio Shack "talking" picture frames that were later featured in a commercial for the electronics retailer filmed on the station. MirCorp believes that many of the same commercial projects planned for Mir, including tourism and filmmaking, will also be suitable for the new station. "We have shown there is a market for a different type of customer, whether a tourist, a commercial scientist, a filmmaker or anyone who is healthy and has a dream of space travel. MirCorp's mini-station answers this market need," said Gert Weyers, MirCorp's senior vice president for product commercialization. In contrast, Weyers said such commercial activities would be more problematic on ISS, a conclusion supported by the debate between Russia and the other ISS partners regarding Tito's flight earlier this year. "MirCorp understands that the International Space Station is dedicated to world-class science and belongs to multiple governments," Weyers said. Because Mini Station 1 will be serviced by the same taxi flights already planned for the International Space Station -- and thus presumably at least partially paid for by commercial customers -- this agreement "allows us to fully develop this commercial market and support ISS at the same time," said Manber. "This is a great agreement for ISS, its partners and everyone who dreams of flying to space."